This section provides a very detailed view of each component, its connections to other components, internal design, responsibilities and interactions with other components. First of all, it’s extremely significant to understand there are actually two independent paths for pressurized air to move through these components. One path provides the pressurized air to the Air Gate and Roller Valve. The other path provides the pressurized air that drives the Cylinder. All pressurized air enters the Air Circuit through the first butterfly valve in the circuit. Immediately after the first butterfly valve there is a tee that splits the incoming pressurized air stream into two paths. One path leads directly to the 4-Way Valve to drive the cylinder. The second path sends pressurized air towards the Air Gate. The path through the Air Gate goes to the Roller Valve, and on to (when appropriate) to the 4-Way Valve’s Spool Control Port. A hose connects the front port on the cylinder to Port 4 on the 4-Way Valve. 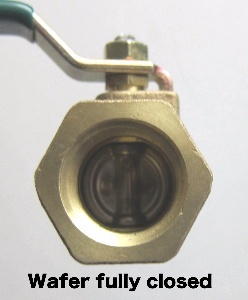 A hose connects the rear port on the cylinder to Port 2 on the 4-Way Valve. The cylinder rod is screwed into the bottom unit of the Alignment Coupler. Clamping. While in the Single-Hit and Clamp Mode, if the operator presses the treadle all the way down and holds it, the Ram will move all the way down and stay down, clamping any object that is between the dies. 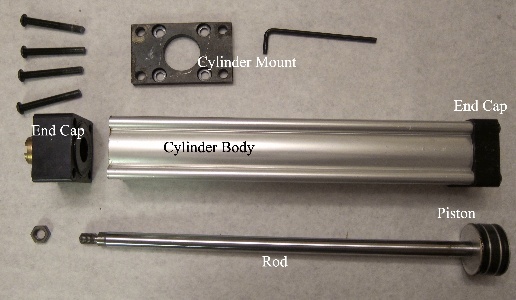 The picture to the right identifies the parts of a cylinder. The rod is guided through the front of the cylinder end cap by a bronze bushing. Pressurized air flows to (and from) the cylinder from the 4-Way Valve to move the cylinder rod. Cycling. Pressurized air from the 4-Way Valve moves into the rear, then front of the cylinder alternately. Air flowing into the rear cylinder port from the 4-Way Valve pushes the internal piston toward the front of the cylinder, extending the Rod and pushing the Ram up. The air that is in front of the moving piston is pushed out the front port on the cylinder and flows into Port 4 of the 4-Way Valve then out Port 5 as exhaust. Air flowing into the front cylinder port pushes the internal piston toward the rear of the cylinder, retracting the Rod and pulling the Ram down. The air that is in front of the moving piston is pushed out the rear port on the cylinder and flows into Port 2 of the 4-Way Valve then out Port 3 as exhaust. Since air moving into the Cylinder alternates between the front and rear Cylinder ports, the Cylinder rod is cycled in and out rapidly. Cycle speed is controlled by the operator with the treadle. Single Hits. The Cricket can be put into the Single-Hit and Clamp Mode. When the operator presses down on the treadle, the cylinder will pull the Ram down without cycling. When the treadle is released, the Ram will rise to its upper-most position. Clamping. While in the Single-Hit and Clamp Mode, if the operator presses the treadle all the way down and holds it, the Ram will stay down, clamping any object that is between the dies. Clamping force will vary with running pressure and the size of the cylinder. The original Cricket will clamp with a force of approximately 300 pounds when it is being run at 80 PSI. The Alignment Coupler is the interface between the cylinder rod and the ram assembly. The lower part of the Alignment Coupler is screwed onto the end of the cylinder rod. The upper part of the Alignment Coupler is screwed into the guidance side of the Ram Assembly. Provide an interface between the Cylinder Rod and the Ram Assembly that does not require that interface to be in perfect alignment. The picture to the right shows the parts that make up the Alignment Coupler. The bolt head is slightly domed. One side of the washer matches that dome. The bolt goes through the body on the right with the washer sitting on its head. The component on the left screws tight into the body on the right, allowing the head of the bolt to turn and move slightly lateral during operation of the hammer. The Alignment Coupler provides a soft interface between the cylinder rod and the Ram Assembly that accommodates slight lateral movement during cycling. This prevents stress on the cylinder rod if alignment with the ram assembly is not perfect. 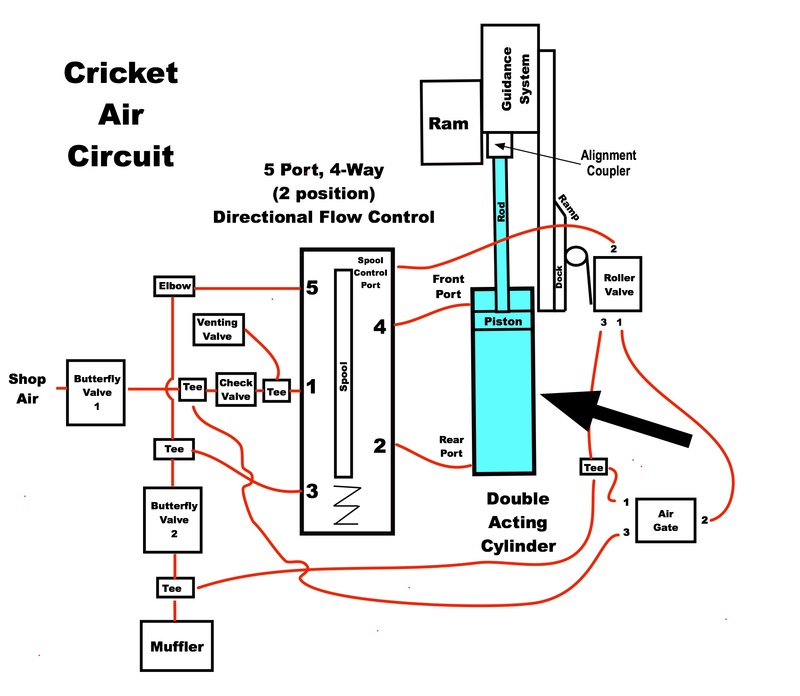 This valve is the HEART of the Cricket Air Circuit. 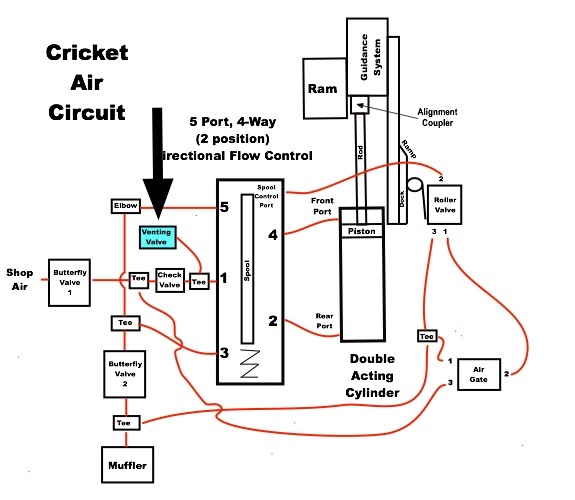 The Cricket uses a 5-Port 4-Way 2-Position Directional Flow Control Air Valve, manufactured by Norgren. The Directional Flow Control Valve functions as a 4-Way Valve, using 5 physical ports to move air into and out of the Cylinder. This valve is referred to as a 4-Way Valve because only 4 of the 5 major ports are open at any instant in time. Port 1 is the input-air port. It has a line of components (Shut-off valve, tees and check valve) connected to it that lead back to a source of shop air. Port 2 is connected to the rear port of the Cylinder. Port 3 is an exhaust port (used when air is going back to the 4-Way Valve from the rear of the Cylinder). Port 4 is connected to the front port of the Cylinder. Port 5 is an exhaust port (used when air is going back to the 4-Way Valve from the front of the Cylinder). The Spool Control Port is connected to Port 2 of the Roller Valve. This port is used to control an internal spool (details provided below). Routing pressurized air to the front and rear ports of the Cylinder alternately, to cycle the Ram. Dynamically reconfiguring the internal routing paths to support sending pressurized air alternately to the front and rear of the cylinder. The 4-Way Valve has a set of ports and paths that are used to route incoming air to and from the Cylinder. 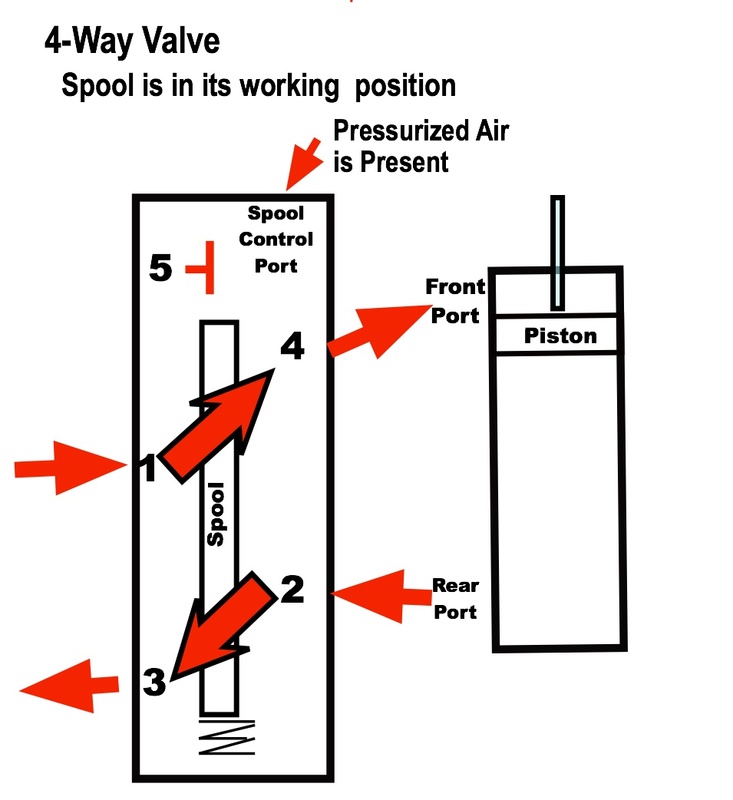 To manage the constant re-routing of air to (and from) the Cylinder, the 4-Way Valve has an internal mechanism, called a “spool”, which controls the configuration of the 4-Way Valve’s internal paths. The Spool has a dedicated port, called the Spool Control Port, which is used to assist in its operation. 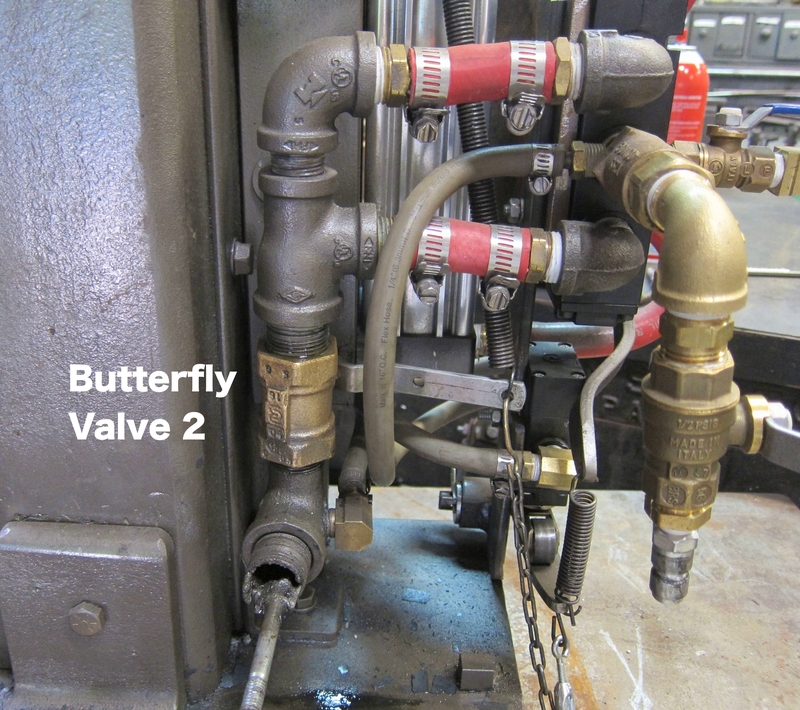 When Butterfly Valve 1 is opened, pressurized air (from a shop source) moves into the air circuit through port 1. 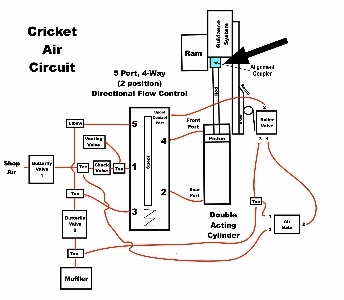 Initially (until the Treadle is pressed down), that pressurized air just “populates” the Air Circuit. Butterfly Valve 2 blocks the air from moving through the Air Circuit. Cycling does not occur until the Treadle is pressed down. When the Treadle is pressed down, Butterfly Valve 2 opens. 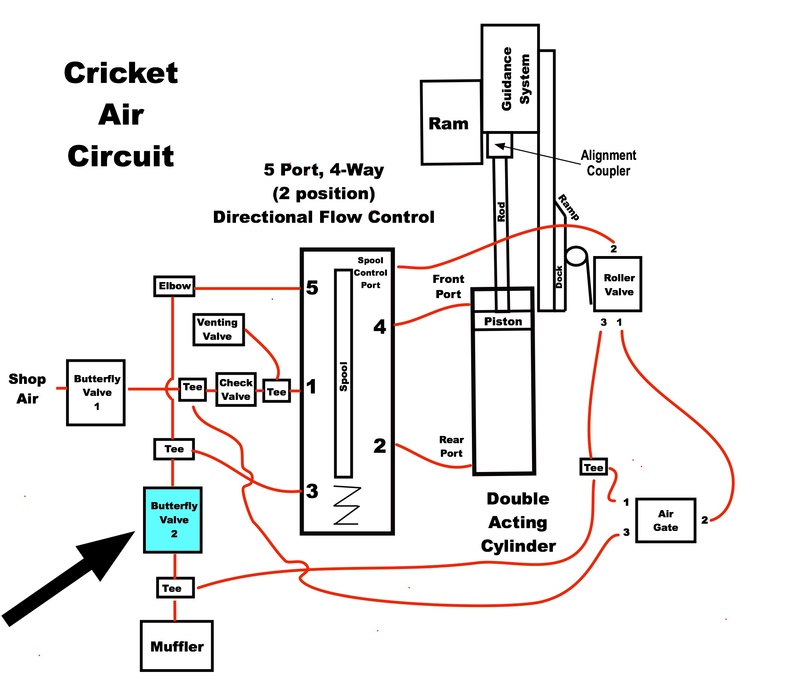 Pressurized air then continuously flows into port 1, passes through the air circuit (cycling the Ram) and exits the air circuit through Butterfly Valve 2. The spool moves back and forth between two positions, “Normal” and “Working”, within the 4-Way Valve. 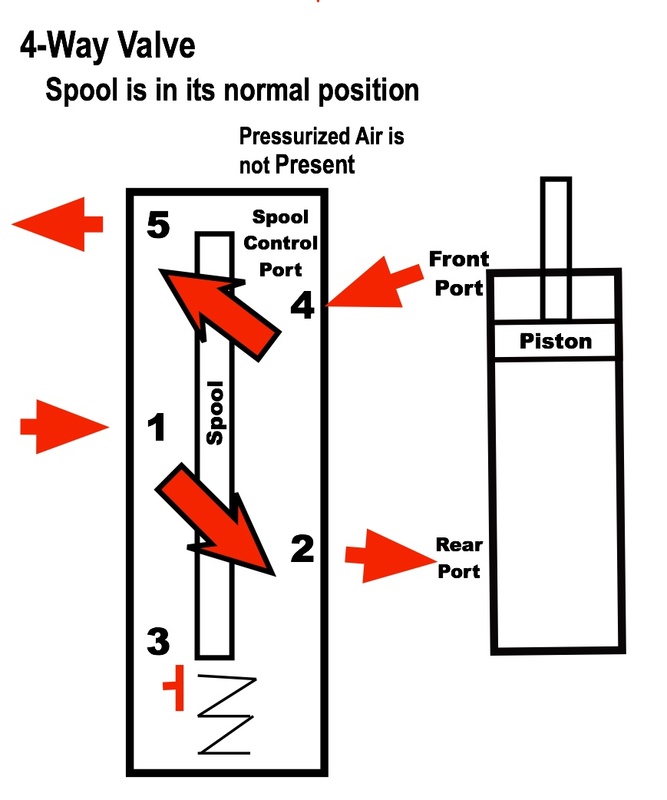 The Spool is controlled by the presence or absence of pressurized air at the Spool Control Port. It has two positions… “Normal” and “Working”. The Roller Valve interacts with the 4-Way Valve to effect movement of the 4-Way Valve’s internal spool. The Roller Valve forwards pressurized air to (or takes it away from) the Spool Control Port. 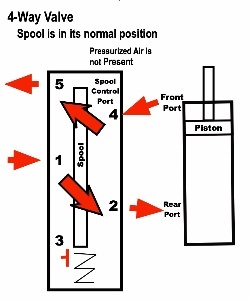 When there is no pressurized air present at the Spool Control Port, the spool is in its normal position, held there by a spring, which is pushing it toward the Spool Control Port. In its normal position, the spool configures a path (through the 4-Way Valve) from port 1 to port 2 and a path from port 4 to port 5. Port 3 is blocked. This routes incoming air to the rear of the cylinder, extending the rod out and pushing the ram up. The spool is moved to its working position when pressurized air flows into the Spool Control Port (the spring is compressed as the spool moves to its working position). The pressurized air flows from Port 2 of the Roller Valve. In its working position, the spool configures a path (through the 4-Way Valve) from port 1 to port 4 and a path from port 2 to port 3. Port 5 is blocked. This routes incoming air to the front of the cylinder, retracting the rod and pulling the ram down. Butterfly Valve 1 is a hand-operated air valve installed at the front of the air circuit. It’s used to to “Turn On” the Cricket. Functionally, Butterfly Valve 1 is installed next to the Check Valve. On the Cricket, there is a tee (with a hose barb) between the Check Valve and Butterfly Valve 1. The hose barb provides pressurized air to Port 3 on the Air Gate. 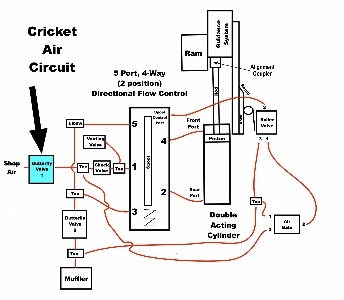 Allowing pressurized air to enter the Air Circuit. Limiting the maximum air volume entering the Air Circuit. A butterfly valve is similar in construction to a ball valve, with one exception. 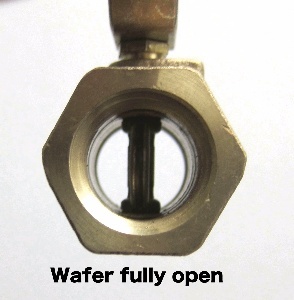 The butterfly valve has an internal “wafer” the lever turns, rather than a ball with a hole in it. When the lever on a butterfly valve is turned, the wafer turns, allowing the passage of pressurized air. The butterfly valve is used in lieu of a ball valve because the volume of air allowed through the valve is more proportionally associated with lever movement than that of a ball valve. This provides the operator with much more control when cycling the hammer. When Butterfly Valve 1 is opened, pressurized air (from a shop source) enters the air circuit. The Ram will rise to its upper-most position. The Ram will not cycle until the treadle is pressed. The reason the Ram moves up and does not cycle is explained in the Technical Descriptions section. When this valve is opened, it should be opened slowly to avoid the Ram being slammed upward. Pressurized air will enter and fill the Air Circuit, but will be held in check at Butterfly Valve 2. In most instances, the operator will fully open Butterfly Valve 1. This allows the operator access to the maximum capabilities (cycle speed) of the hammer. If the operator wants to limit the maximum cycling speed of the hammer, he may do so… by only partially opening this valve. 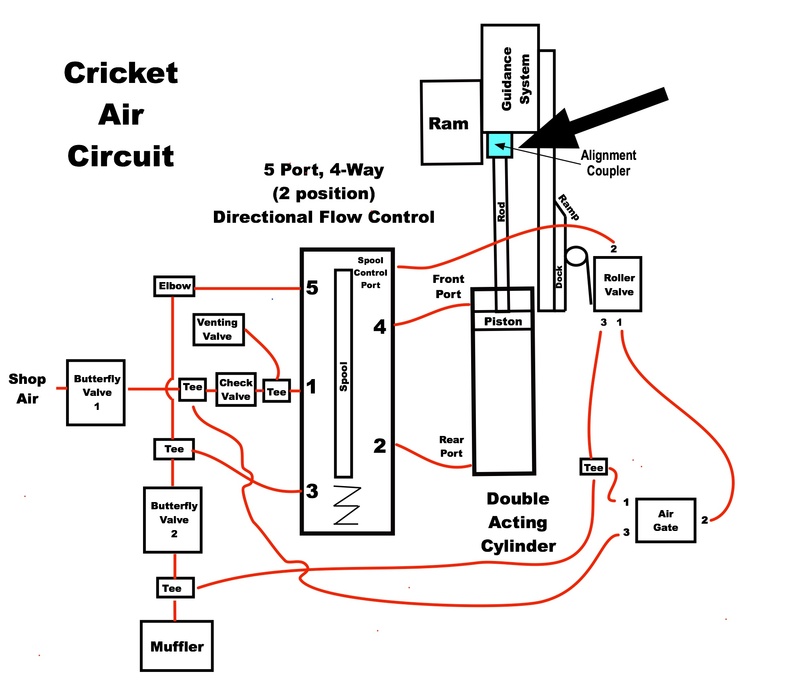 The reason “partially opening” Butterfly Valve 1 limits the maximum cycling speed of the Cricket is because it limits the volume of air entering the Air Circuit… thereby limiting the number of Ram cycles per minute. When the operator ends the forging session, Butterfly Valve 1 is closed. Butterfly Valve 2, is a lever-operated air valve installed on the back end of the air circuit. 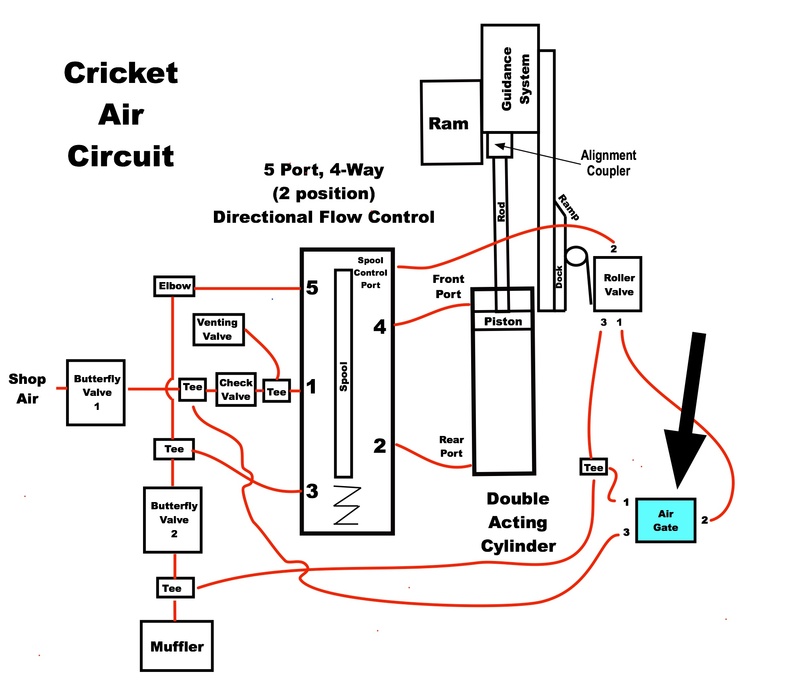 The “back end” of the air circuit is sometimes referred to as the “exhaust side”. 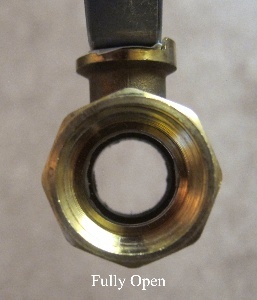 A manifold (put together with iron plumbing fittings) is used to connect the top side of Butterfly Valve 2 to Ports 3 and 5 on the 4-Way Valve. The bottom side of Butterfly Valve 2 has a street elbow that is connected to the muffler. A hose barb is screwed into the side of the street elbow. 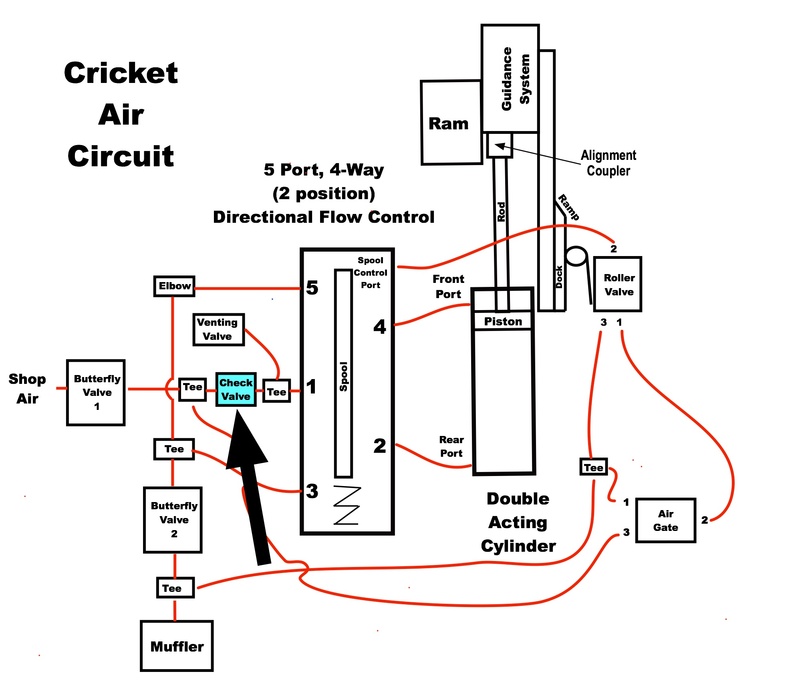 The hose connected to the hose barb services the pressure release paths for the Roller Valve and Air Gate. 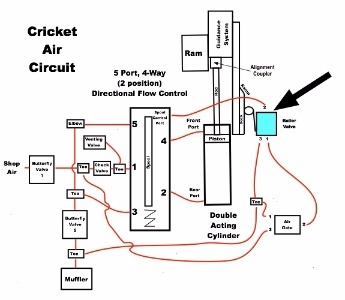 Metering the volume of air flow through the Air Circuit. Providing the operator the ability to control the cycling speed of the Ram. Allowing a “Wisp” of air to pass through the air circuit to raise the Ram to it’s upper-most position when Butterfly Valve 1 is opened. Both butterfly valves are identical, so the internal design is the same as Butterfly Valve 1. Butterfly Valve 2 is the control point for running the Cricket. 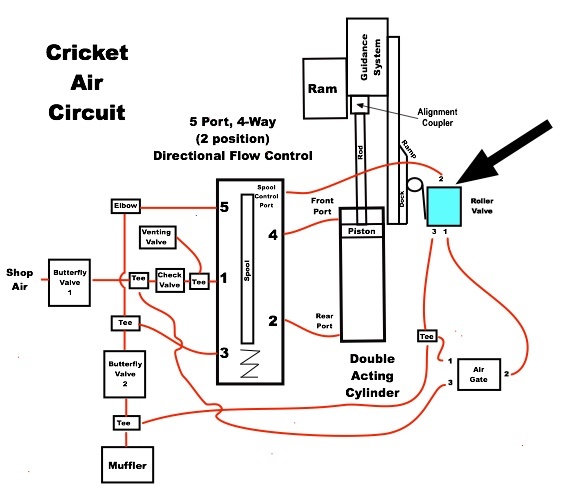 Review… When Butterfly Valve 1 was opened to “Turn On” the Cricket, it was stated that pressurized air entered the Air Circuit. As long as the Treadle is fully-up, Butterfly Valve 2 blocks that air from moving through the Air Circuit. When Butterfly Valve 2 is opened, the pressurized air (already) in the Air Circuit immediately begins to move forward (flow) through the Air Circuit (exiting through Butterfly Valve 2) causing the Ram to cycle. The lever on Butterfly Valve 2 is connected (via chain linkage) to the treadle. 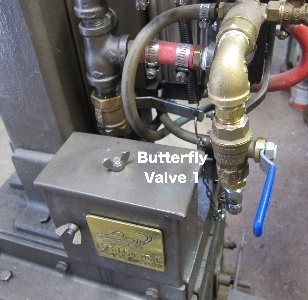 When the treadle is pressed down or let up, Butterfly Valve 2 opens and closes. The operator controls the speed (cycles per minute) of the Ram by moving the treadle. 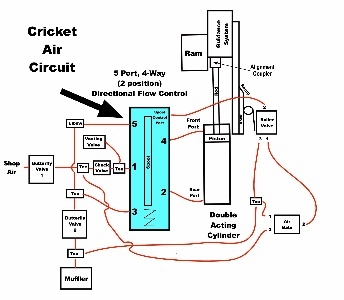 This is a result of controlling the volume of air allowed to flow through the air circuit. When the treadle is fully up, Butterfly Valve 2 is (mostly) closed and blocks movement of air through the Air Circuit (no Ram cycling). Pressing down on the treadle opens Butterfly Valve 2, allowing a metered volume of pressurized air to continuously enter the air circuit through Butterfly Valve 1. Passes through the Air Circuit. 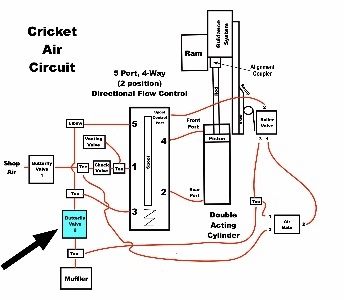 Exits the Air Circuit through Butterfly Valve 2. If the treadle is pressed down just a little, Butterfly Valve 2 is opened just a little (limiting the volume of air entering the circuit), and the Ram will cycle slowly. 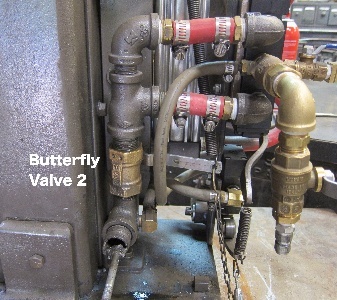 As the treadle is pressed down further, Butterfly Valve 2 is opened further… allowing a higher volume of pressurized air to enter the Air circuit, resulting in the Ram cycling faster. 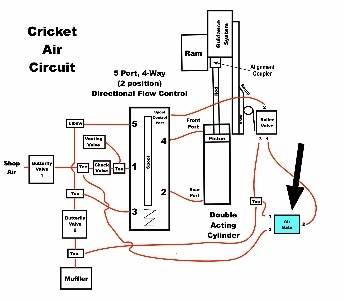 This air circuit will cycle the Ram more than 200 times a minute when the treadle is pressed down all the way. 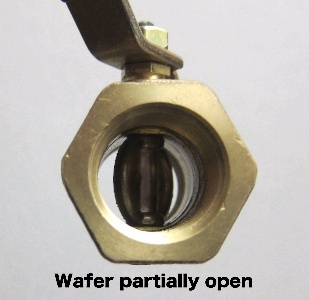 The “Wisp of Air” (mentioned in Responsibilities) is actually a small opening of this valve. It needs to be blocked open just a tiny bit when the Treadle is fully-up. This allows a small amount of air to flow through the Air Circuit. This rises, then keeps the Ram at its fully-up position after Butterfly Valve 1 is opened and the Treadle is in its fully-up position. Even though this small “Wisp” of air is allowed to enter the Air Circuit, it does not result in the Ram Cycling. Cycling has been disabled by denying pressurized air from reaching the Spool Control Port on the 4-Way Valve. 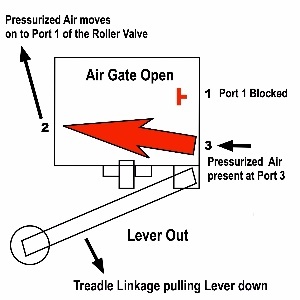 Pressurized air is denied because the Air Gate is closed when the Treadle is in its fully-up position. Previously, it was stated that the 4-Way Valve is the heart of the Air Circuit. The Roller Valve is the PACEMAKER. The Roller Valve is a 3-way, 2-Position Valve, manufactured by Norgren. A Roller Valve is sometimes referred to as a limit switch. Port 1 is connected to Port 2 of the Air Gate. This port is used to receive pressurized air from the Air Gate. 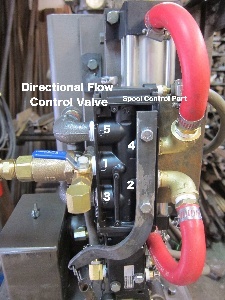 Port 2 is connected to the Spool Control Port on the 4-Way Valve. This port is used to send pressurized air to the 4-Way Valve’s Spool Control Port. Port 3 is connected to a hose line going to the Muffler. This port is used to release pressurized air from the 4-Way Valve’s Spool Control Port when the lever on the Roller Valve is let out. 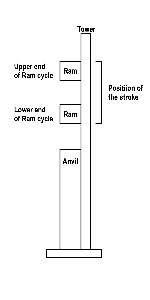 Detecting when the Air Circuit should initiate changing the direction the Ram is moving. Sending a signal to the 4-Way Valve to change the position of its spool to initiate changing the direction the Ram is moving. Setting the Position of the Stroke. Releasing pressurized air from the hose to the Spool Control Port. The lever on the Roller Valve is spring-loaded to be “Out”. To manage the constant re-routing of air, the Roller Valve has an internal spool, (controlled by the position of an external lever), that manages the configuration of its internal air passageways. The external lever (when pressed in), forces the Roller Valve’s spool to move between two positions. When the lever is allowed to move out, the spool returns to its prior position. Lever pressed In… a path is opened through the valve between ports 1 and 2. Lever let out… A path is opened through the valve between ports 2 and 3. 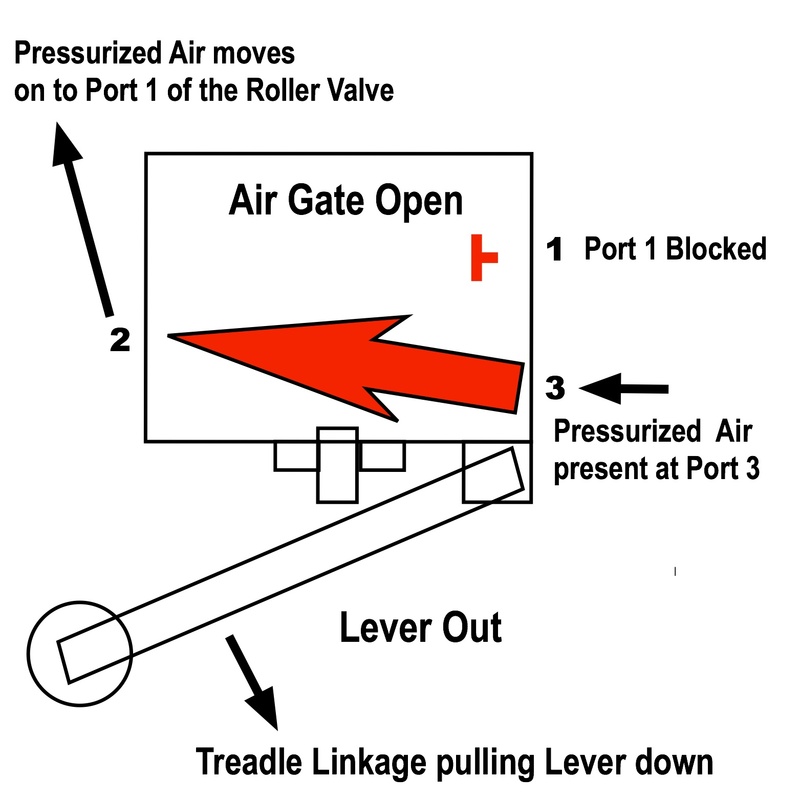 Pressurized air is forwarded to port 1 of the Roller Valve (from the Air Gate) when the Air Gate is opened by the Treadle. 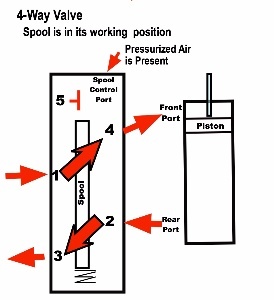 That pressurized air may, or may not, enter the Roller Valve. If the lever on the Roller Valve is out, Port 1 is blocked. The pressurized air will not enter the Roller Valve. 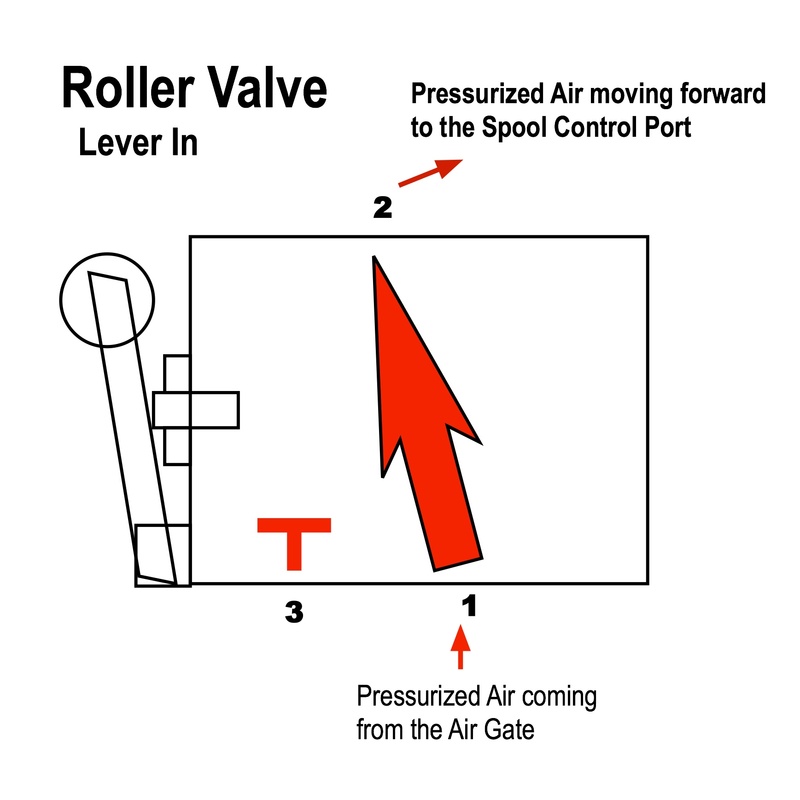 If the lever on the Roller Valve is pressed in, the pressurized air will enter Port 1 and exit Port 2 (moving on to the Spool Control Port). 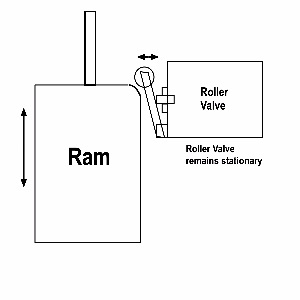 When the lever on the Roller Valve moves “In” or “Out”, a signal is sent to the 4-Way Valve to change the direction the Ram is moving. 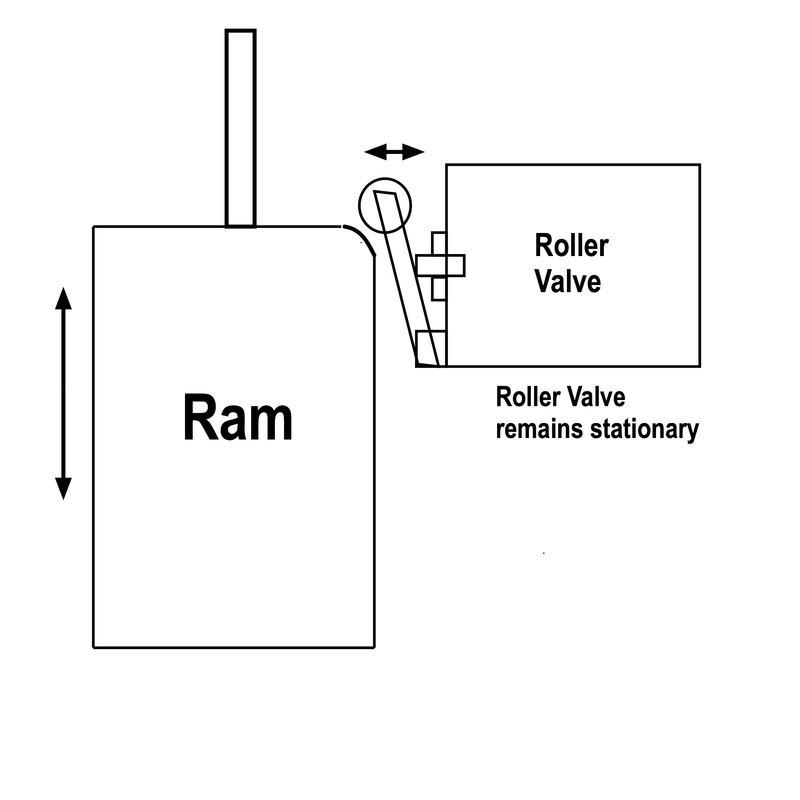 On more conventional air hammers (where the cylinder is above the ram), the roller may move the lever by direct interaction with the Ram. One design has the roller being “pressed in” by an interaction with the top of the Ram (as the Ram is rising), and “Let out” when the Ram is on the way down. In this case, the roller would ride on the Ram, with the lever kept in, between those two events. A second design involves the roller interacting with an addition to the side of the Ram. The addition is a “Ramp” (an inclined plane the roller would move up or down as the Ram passes by)… and a “Dock” the roller remains on until the Ram has reversed direction and is moving the other way. 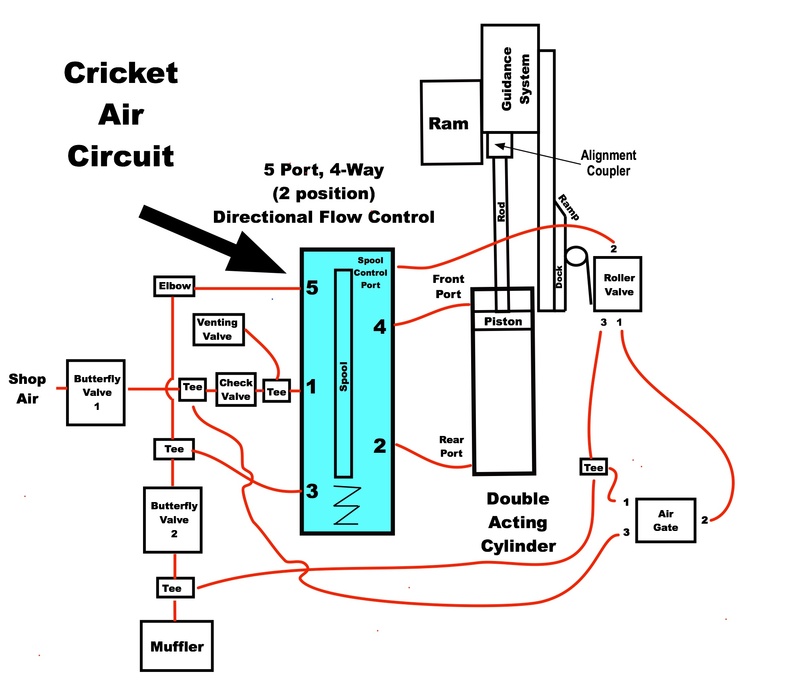 The Cricket uses a Ramp and Dock design to interact with the Roller Valve. The Ramp and Dock, however, are not mounted on the Ram. 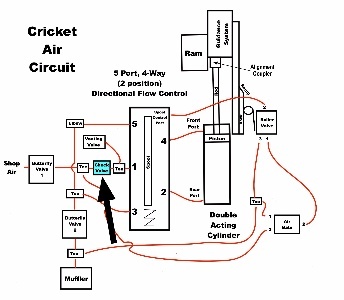 One goal for the Cricket design was to have all Air Circuit components below the table. The solution was to add the Ramp-Dock Assembly, which moved the Ramp and Dock to below the table. 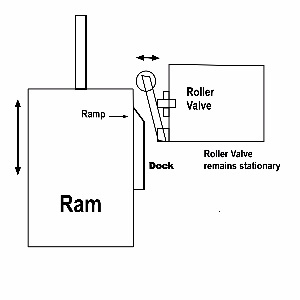 The Ramp and Dock Assembly is bolted to the Ram and moves up (rising Ramp) and down (falling Ramp) with the Ram as it cycles. 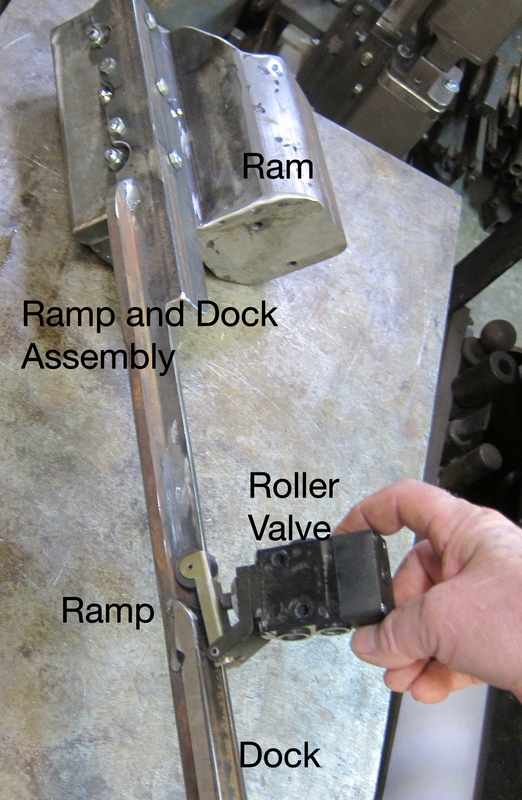 The Roller Valve is mounted on another assembly (the Stroke Adjustment Assembly) under the table and interacts with the Ramp as it passes by. 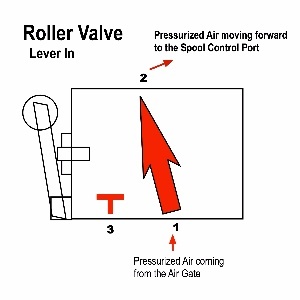 As the Roller Valve’s lever is pressed in (by the rising Ramp), pressurized air 0passes through the Roller Valve and is forwarded to the Spool Control Port on the 4-Way Valve. That pressurized air moves the 4-Way Valve’s spool to its “Working” position. This reconfigures the paths in the 4-Way Valve and directs pressurized air (coming into Port 1 of the 4-Way Valve) to the front port on the cylinder, pulling the Ram down. 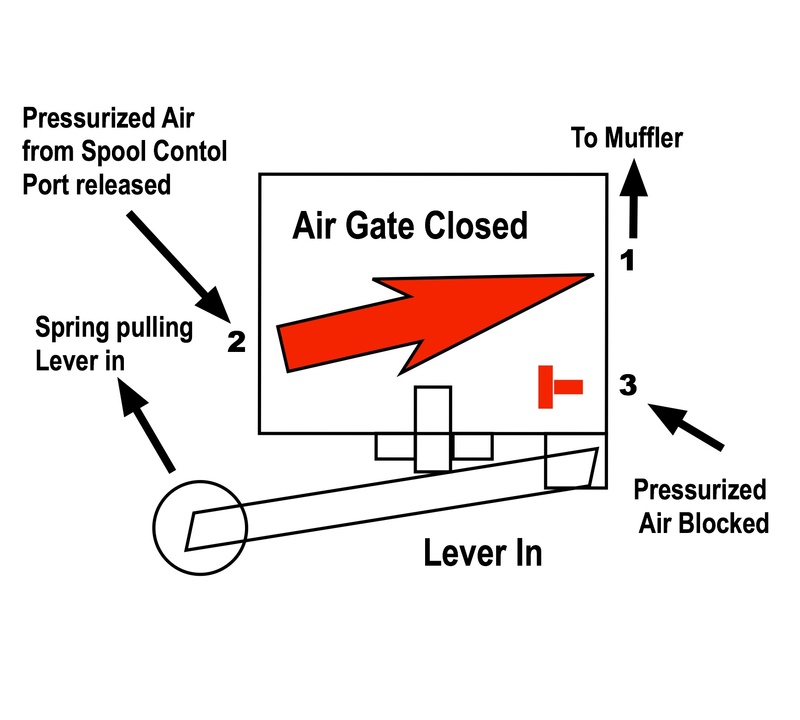 Pressurized air will remain at the Spool Control Port as long as the Roller Valve’s lever is pressed in. Signal to Tell the Ram to Move Up. As the Roller Valve’s lever is let out (by the falling Ramp), the pressurized air present in the hose at the Spool Control Port on the 4-Way Valve is released (vented) and routed to the muffler. The venting path (Port 2 to Port 3 through the Roller Valve) remains open as long as the lever is out. The spool in the 4-Way Valve is moved back to its “Normal” position by the internal spring. This reconfigures the paths in the 4-Way Valve and directs pressurized air (coming into Port 1 of the 4-Way Valve) to the rear port on the cylinder, pushing the Ram up. 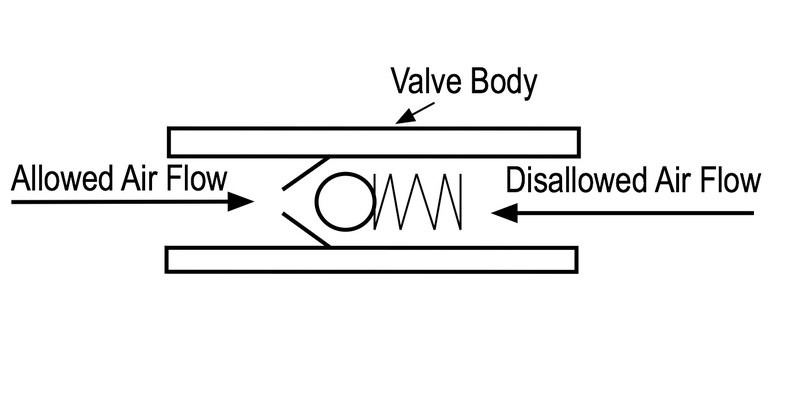 As long as Butterfly Valve 1 is open, and pressurized air continues to enter Port 1 of the 4-Way Valve, the ram will cycle as a result of these two interactions the Roller Valve has with the Ramp. On many utility air hammers, the stroke position is set when the hammer is built, and remains in the same position for all forging situations. The Cricket operator can literally change the Position of the Stroke. The photo on the right shows the Stroke Adjustment Assembly (under the table). The Roller Valve is part of that assembly. 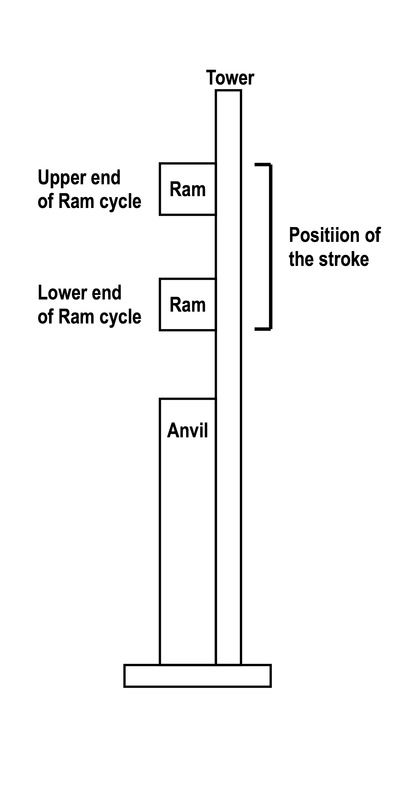 The Position of the Stroke has a direct correlation to the (vertical) position of the Roller Valve. 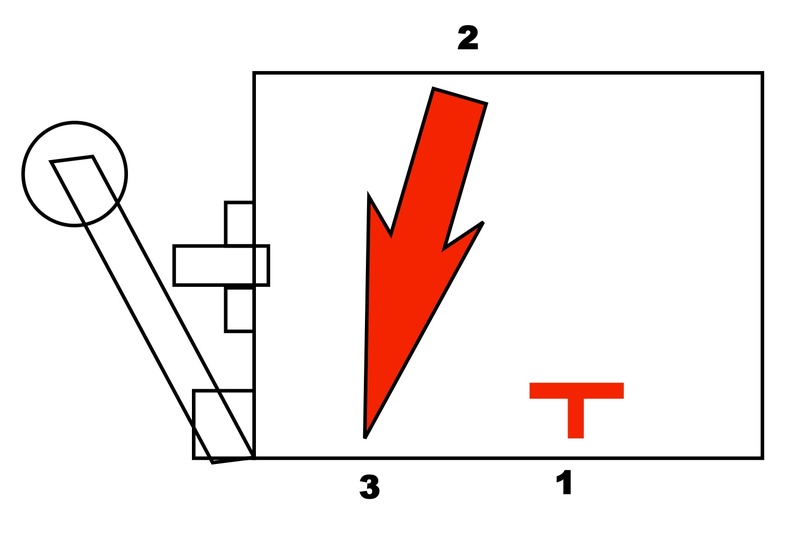 The Position of the Stroke may be moved up or down by moving the Stroke Adjustment Assembly. The Stroke Adjustment Assembly is moved by pulling out its lever, then sliding the assembly up or down its tower, then releasing the lever to lock in the new position. A Check Valve is a flow control device that allows air to flow in one direction only. 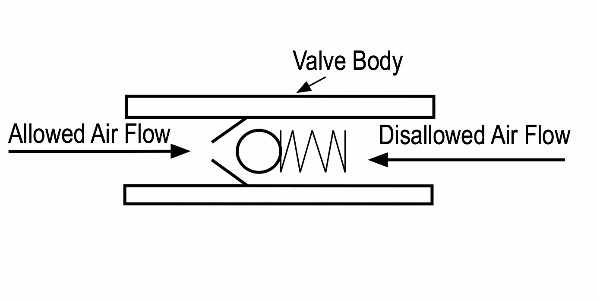 This valve is sometimes referred to as a One-Way Valve. The Check Valve is installed between Butterfly Valve 1 and Port 1 of the 4-Way Valve. Allowing air coming into the 4-Way Valve to move freely. Preventing back flow from the Cylinder after the 4-Way Valve has taken action (reconfigured internal paths) to reverse the direction the Ram is traveling. The Check Valve has a ball that is spring loaded against a conical surface to prevent air flow from one side. When pressurized air is presented from the other side, the ball is pushed away from the cone, allowing air to pass. When pressurized air flow into the the cylinder is reversed to change the direction the Ram is moving, the (cylinder) piston momentarily continues to move in the same direction (due to the momentum of the Ram). This results in the (cylinder) piston trying to push air back into the input stream. The Check Valve prevents this. The Check Valve traps the air in the cylinder ahead of the moving cylinder piston. That air is further compressed before the Ram finally reverses the direction it’s moving. This increased compression provides a significant power boost while forging and planishing. The Air Gate valve is a 3-way, 2-position valve, manufactured by Norgren (the same valve as the Roller Valve). Although the Air Gate is the same physical valve as the Roller Valve, it’s plumbed (functionally) different to accommodate its use. 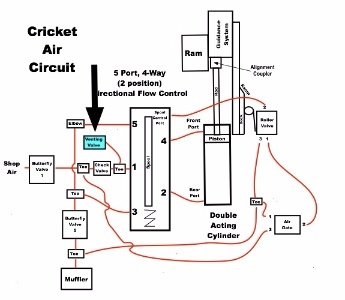 Port 1 is connected to a hose line that goes to the muffler. This is the path used to release pressurized air at the 4-Way Valve’s Spool Control Port. Port 2 is connected to port 1 of the Roller Valve. 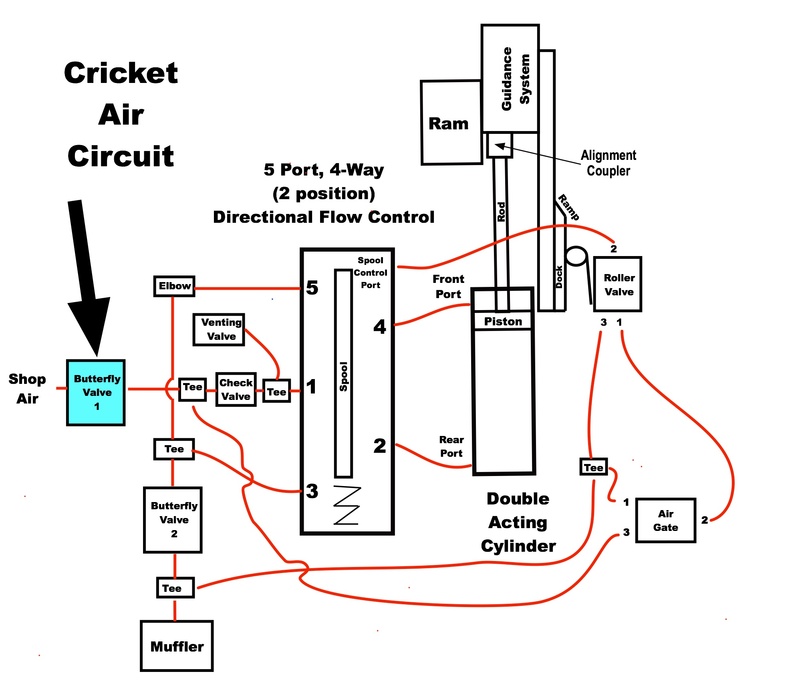 This is the path used to send pressurized air to the Roller Valve. Port 3 is connected to a tee on the input-air line prior to the Check Valve. The tee provides the input-air source for the Air Gate. Pressurized air is always present at port 3 while Butterfly Valve 1 is open. Disabling cycling by providing an on/off switch (with venting) for the pressurized air supply that feeds the Roller Valve. The Roller Valve has an internal spool (controlled by the position of an external lever), that manages the configuration of internal air passageways. The external lever (when pressed in), forces the Air Gate’s spool to move between two positions. When the lever is allowed to move back out, the spool returns to its prior position. Lever pressed in… A path is opened between ports 2 and 1. Lever let out… A path is opened between ports 3 and 2. The lever on the Air Gate is (natively) spring-loaded to be out. 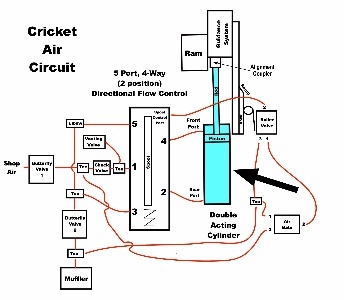 The Cricket Air Circuit design requires that, when the treadle is fully-up, the Air Gate is closed. 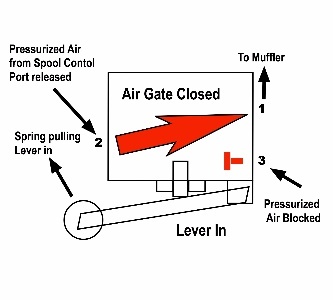 This blocks the flow of pressurized air through the Air Gate. To accomplish this, a second (spring loaded) lever was added on the Air Gate Assembly, which “pulls in” the Air Gate lever, closing the Air Gate. 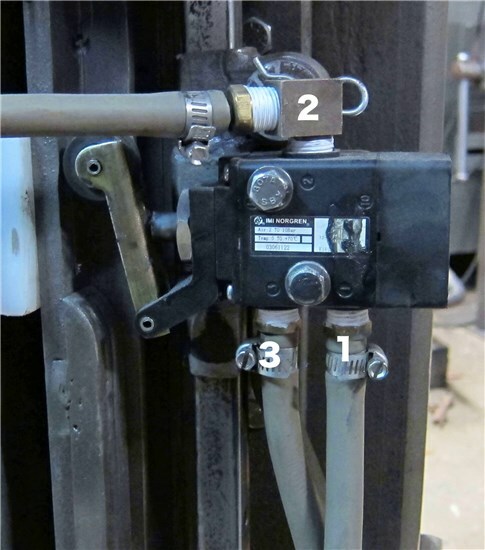 The second lever is connected (via chain, mid-way) to the chain linkage that goes from Butterfly Valve 2 to the Treadle. When the Treadle is pressed down, Butterfly Valve 2 begins to open. The linkage from the Air Gate lags a bit, then opens with Butterfly Valve 2. The small turnbuckle in the photo provides the ability to be able to adjust the lag time. Opening the Air Gate allows pressurized air to move forward to the Roller Valve and ultimately results in the 4-Way Valve’s Spool moving to its “Working” position, directing pressurized air moving into the cylinder to move the Ram down. As the Treadle is let up to its fully-up position, the Air Gate is closed and all pressurized air at the Spool Control Port on the 4-Way Valve is released back to the Muffler. This results in the Spool (in the 4-Way Valve) moving to its “Normal” position, directing pressurized air moving into the cylinder to push the Ram up. The Air Gate supports the Single-Hit and Clamp features. Read the Single-Hit and Clamp discussion in the Technical Descriptions page to understand fully how the Single-Hit and Clamp features work. This is a common 1/4” ball valve. The Venting Valve is installed on a tee next to Port 1 of the 4-Way Valve. Providing a way to release air trapped in the cylinder. Pressurized air is trapped in the cylinder by the Check Valve. This valve is closed during hammer operation. During the shutdown procedures, the Venting Valve should be opened slowly to release pressurized air that may be trapped in the Cylinder. For performance considerations, to keep the volume of air in the Air Circuit at a minimum, this valve should be installed as close to port 1 of the 4-Way Valve as possible. The Cricket has a fabricated muffler. 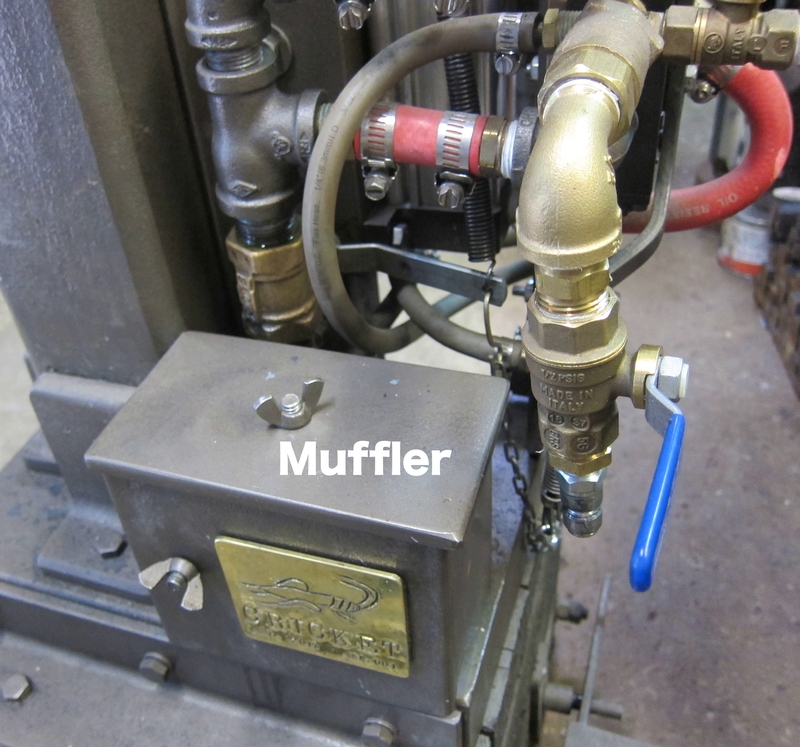 The muffler is connected to a street elbow (off Butterfly Valve 2) on its back side. The muffler on the Cricket is a shop-made metal box, filled with steel wool. It clamps against the street elbow below Butterfly Valve 2. It has multiple small holes in one side to allow exhaust air to be released. The muffler significantly reduces the noise made from air flowing through the Air Circuit. It disperses all pressurized air flowing out the back end of the Air Circuit to free air.